A particle detector for physicists. The Large Hadron Collider people want it back. The Minipix device detects ionizing radiation particles, the kinds of particles which knock electrons off of the atoms in the sensor. These electrons migrate into the electronics, which decide whether the hit was high enough energy to become a signal indicating a particle or if it was just random electrons causing noise. You might remember some of the different kinds of ionizing radiation from school, but we’ll go over the ones you’ve heard of (and some other ones) real quick. Ionizing radiation can come from radioactive elements like uranium decaying, it can be produced in high-energy particle physics experiments, or it can strike the Earth from space. Alpha particles are two protons and two neutrons stuck together. Some elements lose alpha particles through radioactive decay, and your smoke detectors use them to detect smoke. They’re mainly harmful if you inhale or ingest them, since skin can stop them, according to the International Atomic Energy Agency. Radioactive materials can also release beta particles, another name for electrons and their antimatter partner, positrons. These are more dangerous and can penetrate deeper into skin. Massless gamma rays consist of high energy light and requires layers of concrete to stop. In higher concentrations they can even cause cancer. 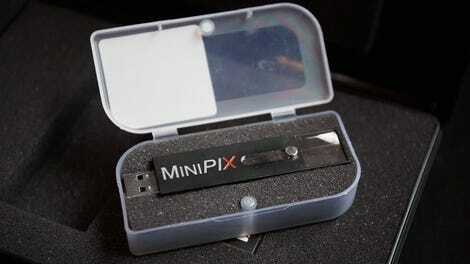 The MiniPix can, theoretically, photograph all of these particles as they pass through the sensor. Its How-To guide would likely prove impenetrable for a non-physicist (I asked a physicist for help), but the setup is simple: it comes with another USB stick loaded with the Pixet software, whose installation is a painless process on any non-ancient Windows, Mac or Debian/Ubuntu Linux machine. On opening, you can change the image settings to make the particle tracks look prettier or assign colors to different energies that show up on the chip. You either set it to Frames or Integral, meaning either clear the frames after a given time range or sum them all up. Frames can give you a snapshot of the radiation of a short period of time, while integral can give you an overall view of the radiation for longer periods. After making it through security and learning that, yes, there were x-rays (but they’re shielded and not especially high-energy), I boarded the plane, which was a good start to really measuring ionizing radiation. Flying six miles up, travelers are exposed to the equivalent radiation of eight dental x-ray exams thanks to the cosmic rays, according to NPR. When I got home, I spent a few nights testing the chip with radiation from some everyday items like bananas and an old smoke detector: The banana didn’t leave a noticeable signal, but the radioactive americium source in the smoke detector produced a shower of alpha particles. Once I got the hang of it, I googled the most radioactive spot in New York City, the site of the old Wolff-Alport Chemical Company, now an auto repair garage and an EPA superfund site. There are definitely some drawbacks to a pocket full of radiation detection. That’s to be expected for any piece of physics equipment that a dummy like me literally just asked a physicist if I could borrow. It runs pretty hot. You shouldn’t run it in the sun (why did I do that) because it will pick up the more energetic light and almost every pixel will record a hit. And if you’re testing it with a banana, make sure you put a piece of Saran wrap over the detector since it’s incredibly sensitive (CERN: I did not get any banana on your chip). You’ll also need some sort of analysis package to analyze your data in a meaningful way. And it costs four thousand bucks. As useful as this might seem, it’s unlikely you’ll need it unless you live near a superfund site, are a physicist, or are trying to escape from Chernobyl. It’s the best (only) pocket-sized particle detector I’ve ever used. It’s cool to carry something like it with you, knowing that some people way smarter than you are are doing more important things than putting a banana onto it and stumbling around a neighborhood on the border of Brooklyn and Queens.